This Monday is Memorial Day which marks the unofficial start of summer! There are many celebrations around this special weekend when we remember to thank our Service men and women and reflect on those who have died serving for our country. Whatever activity you choose during the long weekend, here are some ways you can adjust your plans to include healthy choices. 1. Have the watermelon first, or don’t have it at all: One of the worst habits we have at the summer barbecue is to get loaded up with our burgers and grilled chicken and pasta salad, then bring out the watermelon at the end. This is terrible from a digestive standpoint, as fruit digests very quickly, and if we eat it for dessert after heavier foods, it gets backed up in our system, leading to bloating and other digestive issues. 2. 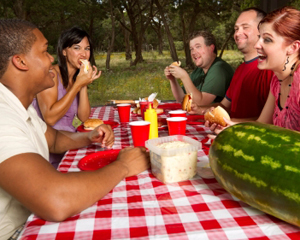 Don’t talk with your mouth full: Barbecues are a popular time to wolf down food, because we’re so busy talking with our friends and laughing. Eating to quickly and swallowing air leads to indigestion and bloating. So talk to your friends, laugh and have a great time, but do it in between eating. Take small bites, and try to not talk until you have chewed properly and swallowed. This will help you keep your digestion in check and will also help you keep from overeating, since you will slow down and you will get full with less food. Avoid sun burning, intentional tanning, and using tanning beds. Wear sun-protective clothing, a wide-brimmed hat, and sunglasses. 5. Beach Days: If you are planning on packing up the beach gear and heading to the water, the kids will expend lots of energy running around in the sand. They’ll have a blast, even if it’s just a little too chilly to swim. Bring beach balls and other fun stuff, pack a cooler with healthy snacks and plenty of water. And don’t forget the sunscreen, even if it is cloudy, the sun is still behind the clouds and can cause a burn. 6. Camping: If you don’t feel like traveling too far, find a local campground. If there isn’t a campground available or you’d prefer to stay in your neck of the woods, just camp in your backyard. Build a fire if the weather is cool and bundle up. Don’t let the weather deter you and your family from having a great time together. Have a picnic in your living room. Spread a blanket out and have the kids help make sandwiches or whatever your family chooses to eat. Have the kids put on a talent show for the family. It could be a music show, a play, reading their favorite poem or book, or even a dance recital. This will keep them entertained and moving for a while and give the family a great memory. Camp indoors. Spread sleeping bags, pillows and blankets in the living room. Make popcorn and S’mores in the microwave (use low-fat graham crackers and only one chocolate square). Put on your favorite movie or TV show, sit back, and have a great evening. I hope you enjoyed this post and welcome any of your thoughts or additional tips you might have to share with other readers so feel free to leave your comments below. Have a Happy, Healthy, and Safe Memorial Day Weekend!